Um. 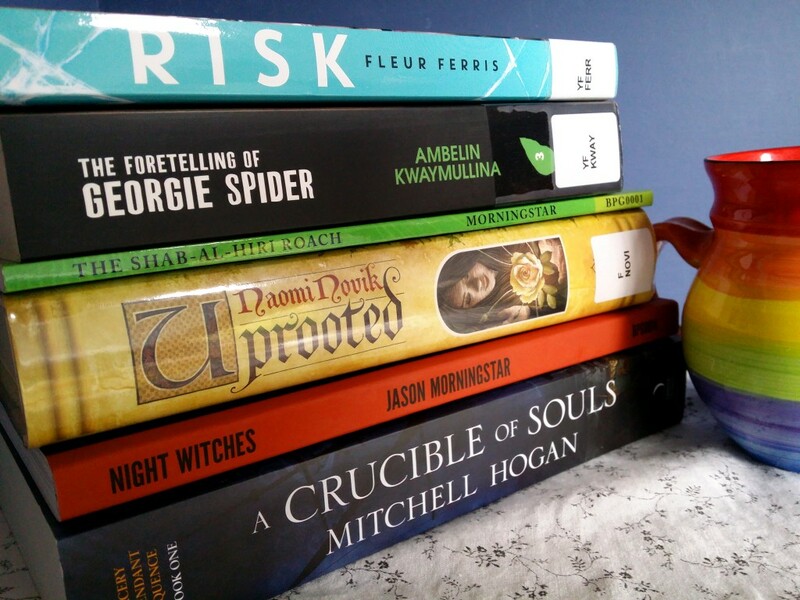 So I might have got a bit carried away with Mt TBR this month (or is it that Mt TBR carried me away this month…?). I think the only thing that saved me was the Bout of Books reading challenge. 40. The Rebel Returns by Becca Lusher. Reviewed here. 41. Night Witches by Jason Morningstar. An RPG about the 588th Night Bomber Regiment, an all-female regiment in the Soviet army in WW2. By day, players struggle to keep their planes maintained while fending off the rampant sexism of the rest of their army and the watchful gaze of Internal Affairs. By night, they fly bombing missions over German targets in flimsy planes twenty years out of date and without parachutes. Players complete missions at six duty stations, reflecting the course of the war. Character turnover in this game is high, reflecting the high casualty rate this regiment faced. A clever and enjoyable RPG. 42. The Foretelling of Georgie Spider by Ambelin Kwaymullina. Reviewed here. 44. A Case of Spirits by KJ Charles. Not quite as engaging as the last few, but still a lot of fun. 45. Getting Wilde by Jenn Stark. Review forthcoming. 47. The Shab-al-Hiri Roach by Jason Morningstar. Another RPG. Set in 1919, an Elder God in the shape of a cockroach escapes onto a university campus. The aim of the game is to be the academic with the highest reputation who has escaped the mind-controlling influence of the cockroach. I haven’t played this one yet, but I can’t wait. 48. Facing the Mirror by Jaye McKenna. An undercover cop has to decide whether to blow his cover in order to save a sexual slave. The m/m erotica definitely plays second fiddle to strong sci-fi elements. A prequel to McKenna’s Guardians of the Pattern series, it did a reasonable job of standing on its own but still had a little work to do. Nevertheless, an excellent intro to the series. 49. Liesmith by Alis Franklin. A young IT geek has to come to terms with the fact his first boyfriend also happens to be a Norse God. Urban fantasy with plenty of horror elements, an Australian setting and a strong narrative voice. Highly recommended. The Court of Five Thrones Ch 54- 55 by Pia Foxhall. I got rather teary through these chapters. There were some beautiful conversations and some difficult material was handled deftly. I’ve been waiting for the last chapter to go up (which should happen today!) to binge on the last four chapters. Thanks! Most of the ones I read were pretty short. Still hoping to hit 80 books for the year, but I’ll be pushing it.